The best outdoor sleeping pad with built-in body heat reflection and weighing only 367 grams? It exists. I bought the Thermarest NeoAir Xlite a year ago in May 2015 before I left for my travel to New Zealand. After reading online through heaps of reviews I decided to go with this mattress and I never regret my purchase. The Thermarest NeoAir Xlite followed me on all of my adventures in the backcountry of New Zealand. Given that it is ultra lightweight with its 367 grams it’s barely nothing to carry. 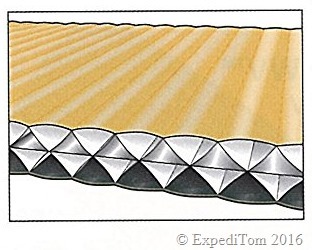 Although Thermarest states that it should weigh 350. In addition, it measures less than a 1 litre bottle when packed. This two features, the measure and the weight, makes it a perfect companion for long distance hikes. I mean really long. On one of my overnight stays in a backcountry hut in New Zealand I met Michael who walked not only the Appalachian trail with the Thermarest NeoAir Xlite but was also on the way to finish the Te Araroa which is another 3’000 km from the southern tip of New Zealand to the northernmost point. He finished just a couple of days ago and I think this sums it up quite well. Despite the outstanding weight and measure of the Thermarest NeoAir Xlite it is unbelievable warm. Inflated you lie 6 cm above the ground and the air in between insulates good. What makes the mattress even warmer is the emergency blanket material which is woven into the mattress inside. This allows the mattress to reflect your body heat and you feel it from the beginning that you have much warmer than with any other mattress. The only drawback of this material is the crushing sound you hear when you move on the mattress. The first night I heard the sound but the following night I didn’t even recognise it anymore. 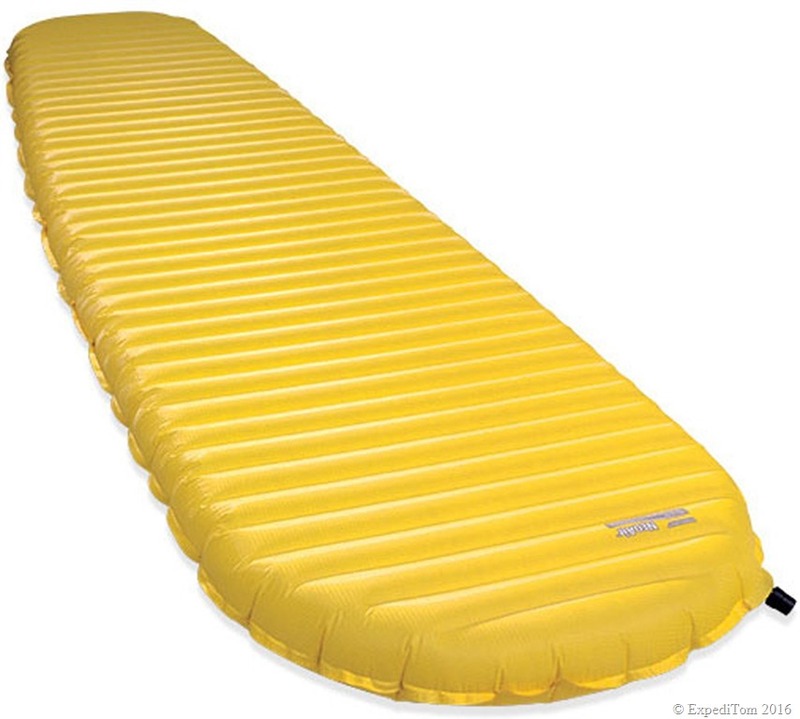 In my opinion unless you have extremely light sleep it can be easily neglected as criterium to not buy the Thermarest NeoAir Xlite. Inside look and how the cold air from the ground is kept at distance from your body heat. Another negative point to consider is the durability of the Thermarest NeoAir Xlite. Given that the material weights barely anything it is not built to resist sharp things such as underground wood or stones. But in my experience the mattress is built strong enough as long as you take general care where you put it. This means, that I have look at the ground first if there are any needles or stones which may pierce it and then sit or lie on the mattress. Additionally, I usually use the Thermarest NeoAir Xlite with the Outdoor Research Aurora Bivy which enhances its protection against any piercings through sharp things. 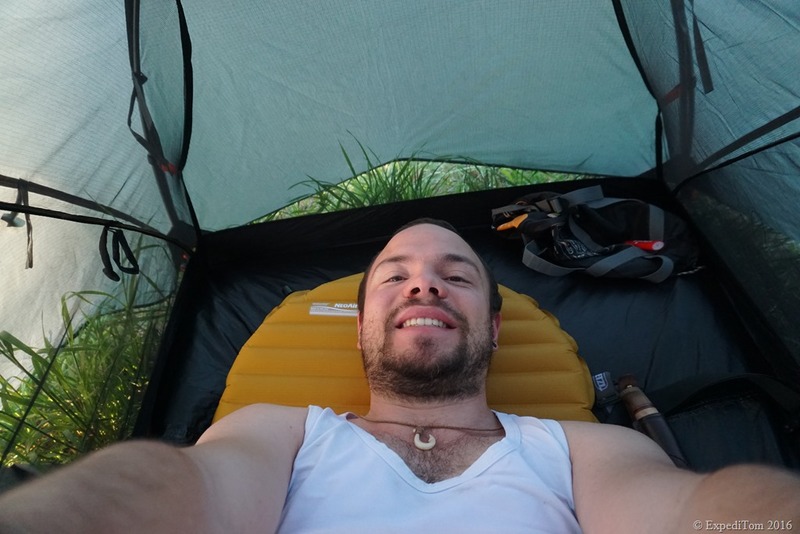 #wokeuplikethis – Thermarest NeoAir Xlite used in my one man tent. Last but not least some people had the problem that one is falling of the Thermarest Neoair Xlite while sleeping because it is somehow slippery in contact with sleeping bag material. In my opinion this happens only if you chose your sleeping spot on uneven ground and isn’t a speciality of this mattress because it happened to me before with another mattress. Enjoying a chilly evening on the Thermarest NeoAir Xlite. All in all the Thermarest NeoAir Xlite is one of my favourite camping items and I don’t want to miss it in my sleeping setup. It does an awesome job in keeping you warm, is incredible lightweight and I can pack it unbelievable small. Although you have to be careful with sharp things around the mattress because it can be pierced easily – it is still as good as it gets in the mattress market – as you can see that even longtime hikers chose the Thermarest NeoAir Xlite for their impressive undertakings. What mattress do you use? Any questions about the Thermarest NeoAir Xlite? Above Eleven Rooftop Bar & Restaurant – Bangkok – Insider tip! ExpediTom Goals 2017 – What’s next? It seems to be excelent ! I’m very interested in something very light and very warm. Thanks ! I too have had one for years and carried it for many miles. They are doubtless good, but just not wide or thick enough for heavy chaps. When lying on your back both arms will rest on the ground (unless you’re really small). In the end i gave up and replaced it with an Exped Synmat UL7 LW. A bit heavier, but far wider, longer, thicker, and more comfortable. I also bought the Exped protective sleeve, to enable me to sleep directly on the ground under tarp with less fear of punctures, and the pillow that clips to the mat. It’s definitely worth considering Exped as an alternative.